Microsoft have launched and application for SkyDrive which is their on line data storage drive. Skydrive allows user a stunning 25 Gigabyte memory on line. This is the one of the largest on line data storing option for users. In order to use Microsoft’s Skydrive all you have to do is sign up for their hotmail and live services. Microsoft have launched skydrive application for iPhone and Windows phone 7 which will be another milestone for Microsoft in producing yet another cross platform application. Microsoft have tuned its skydrive for mobile users, Microsoft have made it easy for their users to save their tons data on line. 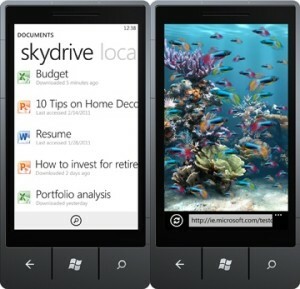 Not only users can save their images, documents, spreadsheets and presentation on skydrive but they can also read it on the go. Skydrive also allows users to share their documents pictures with other users as well. What else would some one want as sky drive is offering 25 gigabyte of data to smartphone users. Skydrive also allows you to save your videos and other media files online, after saving your media files you can stream it when ever and where ever you want. What Would iPhone 5 With 4-inch Display Look Like?